BULK.ID is the official distributor of the Muhr Loading Systems for Belgium and the Netherlands. Over the past few years, the trend of individualization has become ever more significant. In the field of consumer goods, individualization is predominantly used to denote the personal characteristics of the user. This is very different to the field of technology, where individualization — and customization — serves a significant economic purpose. When the individual components within a process are precisely tuned, this can result in much better efficiency. Muhr Loading Systems are a perfect example of individualization in action. It is one of the few companies in its field to offer such a wide range of systems and optional accessories. As well as offering basic open and closed loading, Muhr also offers loading systems of almost every size, with a very wide range of bellows and/or telescopic pipes. Furthermore, the company also has several wear protection systems, integrated or external filter systems, product distribution systems for optimum tank utilization, special designs for foodstuff loading, explosion protection measures, individually adjusted inlet flanges and outflow heads, filling condition sensors, loading controls, and many more. On request, Muhr can also supply each loading system with a combined loading option. That allows both open and closed loading with just one single loading unit. Together with an optional mobile unit, the loading system can be positioned in a fully flexible way over the vehicle, train or ship to be loaded. That allows operators to increase the pace of the loading process and to reduce the costs, thanks to innovative modules. Muhr’s core competence lies in the perfect adjustment of the loading system to the specific customer requirements, such as loading capacity, product properties, product and ambient temperatures, loading conditions, etc. Indeed, the perfectly fitting system makes it possible to achieve optimum results, resulting in maximum productivity, maximum safety and maximum quality. For the Joy Mining company, Muhr supplied a coal loading system in Spitzbergen, Norway, for use in ambient temperatures as low as –40°C, according to ATEX21 regulations. Because of the economically sensitive environment, the system has been built to achieve an extremely dust-free loading operation with a simultaneously higher loading capacity. A costly wear protection system improves the profitability and provides, together with the loading control, an economic operation. See picture on p125. customer decided to adopt the concept presented by the Muhr company. The peculiar characteristic of this system is the dust-free loading both during closed and open loading. 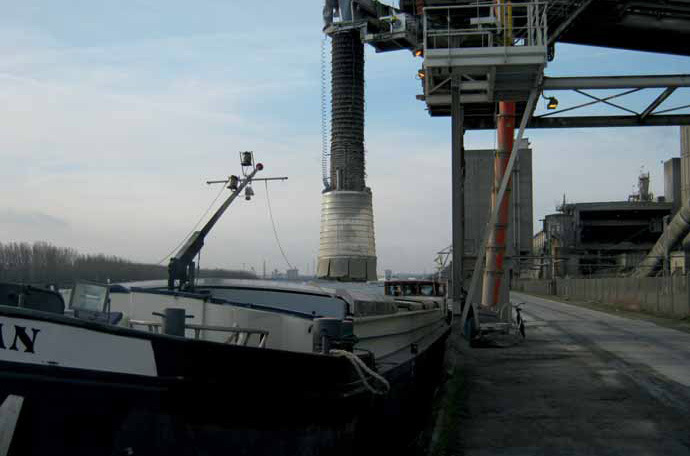 Combined loading system with pneumatically controlled shut-off cone for loading cement onto open ships or tank barges. Closed loading system with integrated filter unit for loading graphite and cokes into closed silo trucks.